Evolution is a great tinkerer. Over the course of millions of years, cells have honed and refined their machinery, selecting many refinements on the basic processes. We can see a perfect example of this by looking at transfer RNA. They are built by ribosomes in the traditional way, using the four standard types of nucleotides. But then a host of enzymes modify the nucleotides to form many different exotic structures. The most common modification is an isomerization: a uracil base is removed, flipped around, and reattached through one of its carbon atoms, changing uridine to pseudouridine. The change from uridine to pseudouridine is subtle and has a subtle structural effect. The new C-C bond connecting the base to the sugar is more flexible than the typical C-N bond found in canonical nucleotides, however, the pseudouridine ironically makes the RNA strand a bit more rigid. The enhanced rigidity is caused by the new placement of the nitrogen atom. In normal bases the nitrogen atom is used to connect to the sugar, but in pseudouridine it is available to hydrogen bond to water. This water then can form hydrogen bonds with the nearby phosphate atoms, rigidifying the backbone and ultimately enhancing the stacking of bases. 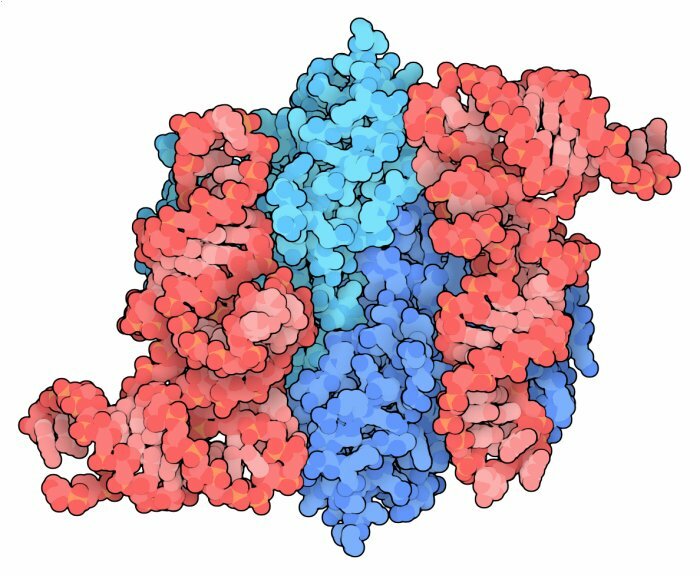 This is thought to be the major benefit of pseudouridine: it adds a little extra rigidity to regions of the RNA that need to have a defined structure. Researchers at CSMP have revealed how Escherichia coli cells modify uridine nucleotides in the anticodon stem loop of transfer RNA. TruA is a pseudouridine synthase that specializes in three positions in the tRNA, positions 38, 39, and 40. These positions are in the critical base-paired region adjacent to the anticodon. The enzyme is a dimer of two identical subunits, which embraces both the 38-40 region of the tRNA and regions farther up the molecule. The enzyme acts on 17 different tRNA molecules in the bacteria cell. It appears to prefer tRNA molecules that are flexible, passing up ones that already have rigid anticodon stem loops. In this way, the enzyme helps the cell fine tune its tRNA, making them rigid but not too rigid for optimal function. The crystal structures show the structural basis for TruA's affinity for flexible tRNA molecules. Three different crystals of the enzyme in complex with two different forms of the leucine tRNA where obtained. Comparing the different structures, the tRNA shows a large range of motion. In several structures, the loop is bent outwards away from the enzyme. These structures highlight the importance of a key arginine amino acid for finding the base and pulling it into the active site. 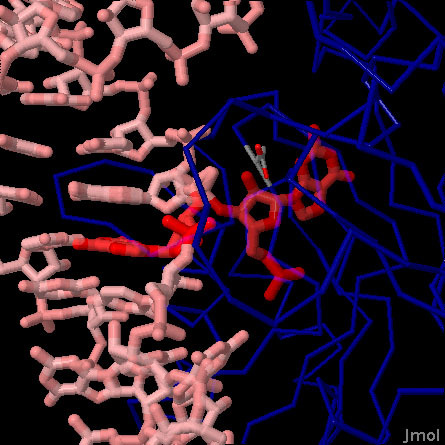 Several of the structures showed a conformation that is later in the process of acting on the base, with the loop folding deeper into the active site. In one of these structures, shown here from PDB entry 2nr0, a base is flipped out of the normal base pair and inserted into the active site. In this case it is guanine 39, so the structure is an abortive complex, since the enzyme does not make any changes to guanine bases. But it gives an idea of what might happen when the enzyme shifts to place a uridine in the active site. A conserved aspartate is there, ready to extract and flip the base. Take a closer look at this interaction using the interactive Jmol view. PDB entry 2nr0 shows two conformations of the guanine base at position 39. One position is stacked normally in the stem, and the other conformation has the base flipped out into the active site of the protein. Flip between these two conformations using the buttons below. Note that several of the bases adjacent to position 39 are disordered in the flipped position, and thus are not seen in the crystal structure. The active site aspartate is also shown with thinner bonds. Notice that it is positioned next to the glycosidic bond connecting the base to the sugar in the flipped conformation. Hur, S. and Stroud, R. M. (2007) How U38, 39, and 40 of many tRNAs become the targets for pseudouridylation by TruA. Mol. Cell 26, 189-203. Hur, S., Stroud, R. M. and Finer-Moore, J. (2006) Substrate recognition by RNA 5-methyluridine methyltransferases and pseudouridine synthases: a structural perspective. J. Biol. Chem. 281, 38969-38973. Hamma, T. and Ferre-D'Amare (2006) Pseudouridine synthases. Chem. Biol. 13, 1125-1135. Charette, M. and Gray, M. W. (2000) Pseudouridine in RNA: what, where, how, and why. IUBMB Life 49, 341-351.